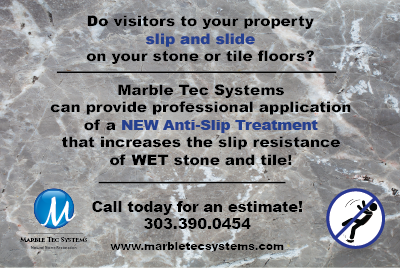 Marble Tec now offering anti-slip treatment | Marble Tec Systems, Inc.
Do visitors to your property slip and slide on your stone or tile floors? Marble Tec Systems can provide professional application of a NEW Anti-Slip Treatment that increases the slip resistance of WET stone and tile. A slip retardant treatment for virtually all granites, quartzites and glazed tiles. Frequently these materials are installed without meeting industry regulations/recommendations in regard to Slip Resistance. This treatment is specifically designed to reduce slipperiness on WET surfaces by causing a chemical reaction, creating microscopic cavities, with some effect on color and texture of the stone. The process can be performed at anytime during the lifecycle of your floors!